Get yourself into the Festive Mood with the New Empreinte lingerie concept store – Art, Food, Travel and Fashion! Since its launch in 1946, Empreinte has become one of the most beautiful and iconic examples of French lingerie, synonymous with combining the perfect unique fit alongside a contemporary elegance. Owing to its huge popularity amongst a range of women along with its impeccable reputation as one of the finest lingerie and swimwear brands, Empreinte is now following demand and opening its first ever international store in our very own capital city: London. An innovative concept store with its exclusive South Molton Street location, the Mayfair address perfectly embodies the Empreinte brand values of elegance, luxury and innovation. 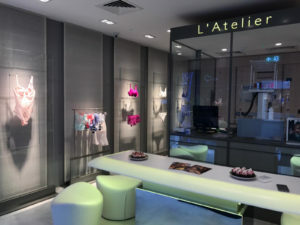 The unique store’s sleek design expertly uses quality materials such as wood, Krion, glass and silken fabrics to create a backdrop that effortlessly showcases the lingerie and swimwear collections. Professional advice, spacious fitting rooms and fashion stylists are just some of the store’s bespoke services that create a unique in store experience for every Empreinte woman. Unlike anything else! The Customisation Atelier. With its customisation workshop, Empreinte offers its customers the ability to personalise their lingerie set and transform it into a bespoke, one of a kind piece. Knots, tassels, embroidery…. Everything is possible!